I love making these little packets! They're regular swaps with the FAA (Fabric Addicts Anonymous) group on Flickr. 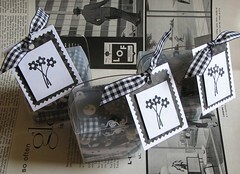 The idea is to make up parcels for three swap partners based on the current theme. Sometimes the theme is a color, sometimes a subject. As you might suspect, the theme for the top photo is Apples. Usually I use opaque plastic Asian takeout containers (from Target). They're cute, inexpensive, and lightweight. 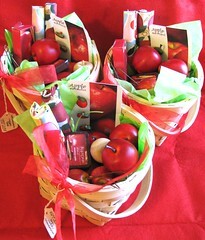 However, I found the little baskets and thought they'd be appropriate for the Apple swap. The baskets contain fabric, a button card I made with apple buttons, apple-scented goodies (candle, lip gloss, etc), and wooden apples (most are hollow). This is more typical of my usual "Lucky Parcels" (I love the name -- m akes me think of a dessert at a Chinese banquet.) The theme was "Black & White." The parcels include fabric, ribbon, buttons, and a bunch of other fabric-related notions. What I find so fun is the way the parcel itself is the best part of the swap -- everyone does them differently but they're always cute and clever.